A major remodeling project — something that can involve a lot of time, money, and inconvenience — is a big deal. Little wonder that homeowners are often scared, sometimes emotional, and in a few cases even irrational. Why do homeowners have such feelings? In basic terms, the home improvement anxiety scale has a “big five” — those issues that more or less get to just about every owner. Here are the items that worry most homeowners — and what you can do about them. Crooks. Experience shows that almost every homeowner begins the remodeling process with emotional baggage. If you watch television, read the newspaper, or listen to the radio, you will inevitably read or hear stories about unscrupulous home improvement contractors. In these stories, some unsuspecting homeowner was taken advantage of and lost thousands of dollars. Therefore many homeowners don’t even trust professional remodelers. They’re afraid they will hire a crook, or they fear that someone working with the contractor will get into their home and steal something. Money. Most homeowners do not understand the difficulty and expense of remodeling their home. Most homeowners underestimate the true cost of remodeling. The reality is that integrating new work and materials with old ones is often a difficult and expensive process. The uncertainties that arise during the remodeling process make it even more difficult. Once a remodeling project begins, the work may expose dry rot, termite damage, bad or outdated electrical wiring, insufficient load-bearing capacity, or other challenges. Whether planned for or not, these problems must all be fixed. Disappointment. In working with hundreds of homeowners over the years, I have discovered that homeowners can work with a set of plans for months and still not fully understand what their projects will look like until the walls start going up. After extended design time and a lot of money, homeowners will say “it’s not what I wanted!” For 90 percent of the ones I worked with, two-dimensional building plans do not provide enough information for most homeowners to clearly visualize what their projects will look like when they are finished. Most homeowners fear, that after spending all that time and money, they won’t have what they wanted. Disruption. Remodeling is tremendously disruptive and invasive. Homeowners can be without their kitchens for weeks or longer. They can be without bathrooms for an equally long time. A major remodeling project can disrupt just about every routine a household may follow. A psychiatrist I know, who himself went through a major renovation on his own home, said it was one of the most difficult times in his marriage. Control. Many homeowners say they’re afraid that once their home remodeling project begins, that the all the unknowns involved in the project will leave them feeling out of control. Because so much is out of their control, many people experience a lot of fear during the process. Their homes are usually one of their biggest investments, and they’re spending a lot of money. They want guarantees, but remodeling a home involves unknowns. Therefore remodelers can’t always provide the kinds of guarantees that homeowners want. They have to trust their remodelers. 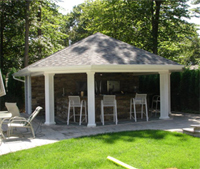 Professional remodelers understand that they are selling a service and a process rather than a product. The best ones understand they must manage the construction process, be aware that they are providing a service, and recognize the emotional concerns which homeowner face. Homeowners, in turn, need to be guided through every step of the remodeling process. They must trust their remodeler and feel certain that the contractor will not abandon them, no matter what. What is it that consumers should expect? Four requirements stand out. Consistency. Remodelers need to set up and follow consistent routines. Honesty. They need to tell homeowners what will happen each week and acknowledge any mistakes. Keeping Promises. Remodelers must keep their word. They must fulfill on the promises they make. Reassurance. Consumers want to know their remodelers will be there to answer their questions and concerns — and that includes answering questions after work has been completed and checks have been cashed. Experienced remodelers realize that a major remodeling project is an emotional time for homeowners and gear their efforts towards reducing homeowners’ fears. Contractors understand there will be delays, surprises, and upsets — it happens and the trick is to help consumers weather such problems. The reward, of course, is a better project, greater consumer satisfaction, and word-of-mouth recommendations that money can’t buy. This article used with the author’s permission. Use of this article without permission is a violation of federal copyright laws..